At HEART we have closely followed the developments in the fraught ‘gay marriage cake’ controversy that mired a Northern Irish family bakery in an escalating legal battle for four years. So along with the Christian Institute which had championed and fundraised for Daniel and Amy McArthur, the young owners of Ashers Bakery, we shared the relief when at long last they won their case at the Supreme Court in October. The McArthur family turned down the order to produce a cake with the slogan, “Support gay marriage” because it conflicted with their Christian belief that marriage is between a man and a woman. All three grounds that Ashers were originally found to have discriminated on were unanimously dismissed by the highest court in the land. The protracted and costly legal action was brought by the taxpayer-funded Equality Commission for Northern Ireland (ECNI). 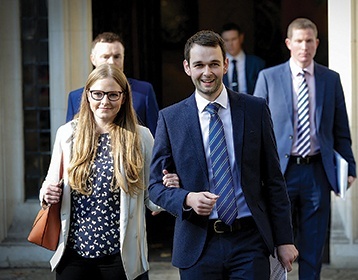 The McArthurs themselves were quick to give all the glory to God after the Court ruled unanimously that their refusal to make the cake was not discriminatory. “We always knew we hadn’t done anything wrong in turning down this order… We’re particularly pleased the Supreme Court emphatically accepted what we’ve said all along – we did not turn down this order because of the person who made it, but because of the message itself. “The judges have given a clear signal today… Family businesses like ours are free to focus on giving all their customers the best service they can – without being forced to promote other people’s campaigns… this ruling protects freedom of speech and freedom of conscience for everyone. Peter Lynas, director of Evangelical Alliance Northern Ireland, commented: “This is a win for everyone, no one should be forced to say something that they disagree with. “It is disappointing that this case has been pitched as Christians versus the LGBT community. “The court found that there was no discrimination on the grounds of religious belief or political opinion, and ultimately concluded that compelled speech would not have been justified in this case. In the light of the Ashers ruling, Mr Lynas also called for updated guidance for business owners and customers from the Equality Commission on the provision of goods and services.